Lauras All Made Up | UK Beauty, Fashion + Lifestyle Blog: Beauty Advent Calendar 2014 For Under £60! Since last years beauty advent calenders post was such a huge hit, and the idea of alternative advent caldendars seems to get more popular every year - especially in the beauty world. I decided to do an updated best of beauty advent calendars 2014 post to get you all in the Christmas spirit! Sorry guys, I know its only October, but the big day will soon come around! 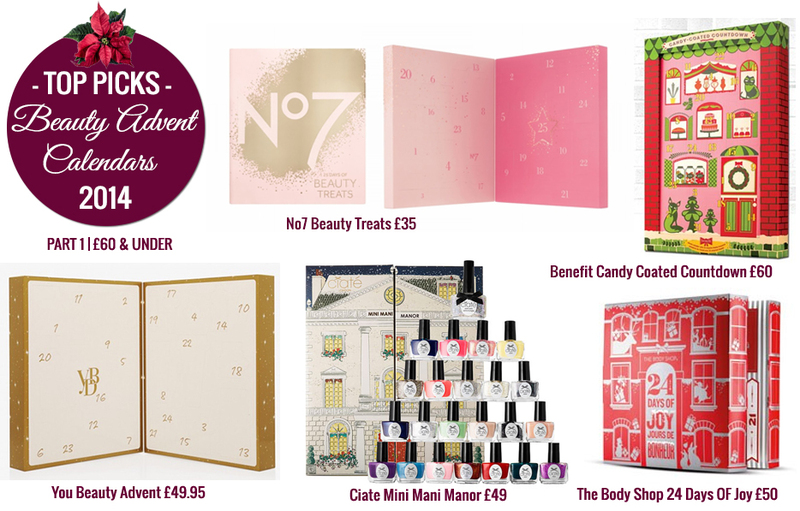 Part 1 | £60 & Under Beauty Advent Calendars! Available from 29th October in Boots stores and online. Last year we had the Boots 25 Days Of Beauty Advent Calendar, but this year, the Boots calendar has been devoted entirely to No7 products. The calendar features a range of make up, nail products and skincare. The products in this calendar add up to a whopping £130(approx) and you can get your hands on it for just £35.00. I guarantee you this beauty will fly off the shelves once released! You can sign up here to be the first to know when it is released. This offering from Benefit features a range of their best-sellers - which if you look through the contents list on the website, I'm sure a lot of you fellow bloggers will recognise instantly, along with some other lovely little surprises. Although this is a little on the pricey side, its definitely worth it, as you get to try out their products before purchasing the full sizes! Available to buy now on the Ciate website! Available now at The Body Shop in store and online. I am not 100% sure, but I think this is a first from The Body Shop, as I don't remember seeing an advent calendar from them last year (I may be mistaken). The 24 Days Of Joy advent is packed full of beauty treats including body, nail, hair and face products as well as fragrances and cosmetic brushses! Available now from the You Beauty Website! The second part of this blog post - Part 2 | Luxury Beauty Advent Calendars coming soon! Which beauty advent calendar will you be buying this year? I would love to try one of these, but they're so expensive! My Ciate advent calendar actually just arrived! EEEEK! I still want more though.. it's a bit like an addiction! Primark also have a jewellery one this year! Super excited! They are all so perfect, I wish I could afford them all! I actually purchased a 'Ciate Mini Mani Month' Advent Calendar on Fragrance Direct way back in August (keeno aren't I haha). I think it was last year's Ciate advent calendar but I got it for £18 which I think is an absolute bargain! Oh wow all looks so exciting, but so expensive. Thanks for posting this. I would love the benefit calendar, I might buy it as a christmas present for myself!